One of the many things that I adore about my co-workers is that they all have a thing for food. They’re always willing to test my latest creations and willing to share theirs. In one breath we’re raving about amazing cookie recipes while we’re at the gym and in the next, we’re ranting about the fact that our pants are a little snug – vicious circle I tell ya. A few weeks ago, my co-worker, Wendy, was talking about a Poblano Beef Stew that her husband made for dinner. Immediately I was intrigued, not only because her husband made it (bonus points to husbands that cook), but because I adore Poblano peppers and Brian has fondness for beef, so this sounded like a win-win. Wendy made a copy of the recipe which I lost and found about five times because it was in my bottomless hole of a purse along with like 20 tubes of lip gloss and a gazillion receipts. After several failed attempts to actually get this on our dinner table – I finally followed through with the recipe yesterday and it was just as delicious as I made it out to be in my mind. Rich, hearty, and of course – beefy – for Brian. While the stew takes a bit of time and effort, every bite is worth it. Enjoy this Roasted Poblano Beef Stew with a loaf of crusty bread and you’ll have the perfect dinner for a chilly February evening. 1. Broil poblano peppers 4 inches from the heat until skins blister, about 5 minutes. With tongs, rotate peppers a quarter turn. Broil and rotate until all sides are blistered and blackened. Immediately place Poblano peppers in a medium bowl; cover with bowl with plastic wrap and let stand for 20 minutes. 2. Peel off and discard charred skins. Remove the stems and seeds and coarsely chop the peppers. 3. In a Dutch oven, heat oil over medium-high heat, brown beef in batches. Remove beef and keep warm. Reduce heat to medium, in the same pan, saute the onion until tender. Add in the garlic and cook for 1 more minute. 4. Pour in broth; stir in the tomatoes, cilantro, Worcestershire Sauce, chili powder, salt, cumin, red pepper flakes, pepper, Poblanos and beef. 5. Bring the stew to a boil. Reduce heat; cover and simmer 1-1/2 hours or until beef is tender. Add potatoes; cook 20-30 minutes longer or until potatoes are tender. Skim fat. - This stew is a little on the soupy side, but you could definitely thicken it up with a little corn starch and cold water. We chose to eat it as is. Thanks so much for Pinning the recipe! My husband looooves stew and I have yet to make any this year!! Definitely giving this a try. Looks great, Jamie!! Wow this sounds amazing. First of all poblanos are my fave, especially when roasted. The smell reminds me of home and my childhood. And the spice combination with fire roasted tomatoes is a bonus. I must try this soon. Thank you! There aren’t many recipes that make me wish I wasn’t a vegetarian, but I have to admit my mouth is seriously watering. That soup sounds amazing! Please thank Wendy for me :) This recipe looks delicious. Your photography is just gorgeous! Jamie, how did you process this photo? Would you mind sharing, please? I really like it. I typically don’t process my photos too much, just the basics. I adjusted the curves on this one, used the dodge tool in areas and sharpened the entire image. All edits were done in CS5. Thanks so much for stopping by. What a lovely stew – perfect comfort food for a chilly February evening! Perfect for a snowy day-like today! This sounds delicious. 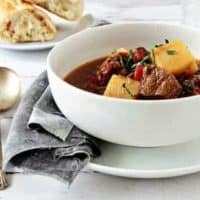 I love beef stew and am always interested in new ways to do it. I am a bit of a whimp and don’t know if I would be able to handle ALL that hot. Is there a way to tone it down without losing the flavor? I would certainly keep the Poblanos but maybe leave out the red pepper flakes? I don’t find Poblanos to be all that hot, especially after being roasted and slow cooked. I find them to be less hot and more flavorful than jalapenos. I will probably leave out the red pepper flake when I make it for my kids, I’ll just add some to my own plate. Once the Poblanos are seeded, there really isn’t a lot of heat to them at all. We actually found ourselves adding hot sauce to this stew for a little kick. I promise it’s not too hot! Thanks for stopping by! I have to bookmark this. Don’t you just love it when something taste just a good as it did in your mind? Was this photo taken outside? It is really a great photo? Thanks for stopping by – nope, the photo was taken indoors. I rarely shoot outside as I find the images often look kind of flat. This image was taken in my kitchen with a sliding glass door to the left and a white board on the right to reflect the light back onto the dish. Hope this helps. This sounds so perfect for colder weather, lovely and rich and hearty! You’re a mindreader… I’ve had poblanos on the brain lately! I gotta have this over some mashed potatoes. Oh, Casey – this would be amazing over mashed potatoes! Gorgeous. I love the idea of roasting the poblanos. I can’t imagine a more fabulous combination – I think I’m in love! Ok, your firend is LUCKY! Her Husband cooks! Man I tell ya, my Husband would live on tootsie rolls and spam if I didn’t cook dinner. The stew is right up my alley! It’s a fantastic recipe, so glad your friend shared it with you. This looks amazing, I love poblanos, thanks for sharing, I can’t wait to try this! This looks amazing!!! I’m going to pin it right away! Thanks so much, Mireia – I appreciate the Pin! Mmm, this looks perfect for the stormy weather we’re having! This looks INcredible, Jamie. How do you do it?! I thought I was done with hearty winter fare, but this post has made it clear that I am not. Pinned for a future family dinner! I heart men who cook :) Mine will cook if I’m too sick to get off the sofa or if he’s alone. What fun is that? This stew looks amazingly good! Wow, this looks fantastic! I love spicy food, so peppers in beef stew sounds like an amazing idea. I bet this would be so good on a cold, snowy day. 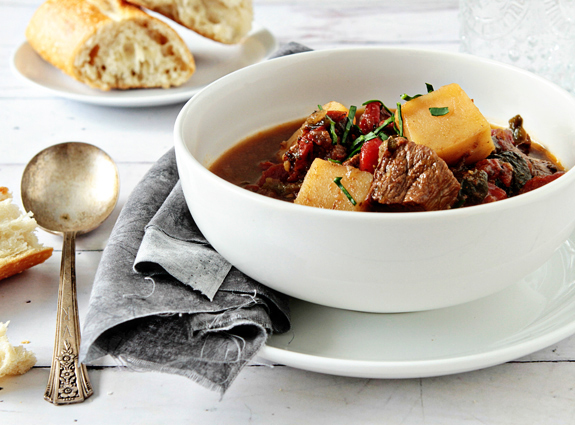 I just have to change my meal plan for tonight because now I want these beef stew! this is DELISH! We love spice, so I actually added 1 sliced jalapeno (sliced but not seeded). The flavor was amazing and the incredible smell of everything marinating together as it cooked was so insane I had to keep running in to taste small bits to see how it was coming. Yummy!! If you don’t like spice, it truly is not spicy. Poblanos are very mild, especially once broiled/roasted. Possibly try tomatoes without the ‘fire’ and garlic, although we loved them. Since its just the two of us, freezing half to thaw later for a quick weeknight meal. Such a great tweak on the traditional beef stew and added to my recipe book :) Thank you for sharing! I just made this for dinner tonight!!! It’s so fabulous and tasty:) I omitted the potatoes and threw in some beans and fire roasted corn based on my families preference. Got everything from the local farmers market and it truly is farm to fork! Thanks Jamie for this wonderful recipe !! Do you think this recipe could be made in a slow cooker once you broil the peppers? Nicole, I definitely think that could work. Is there a way to substitute the potatoes with something else? Maybe with white hominy? Only asking because I’m allergic to potatoes! I think you can substitute the potatoes with anything you want. :)Enjoy.